Pineapples are a tropical fruit known for their sweet flavor and unique appearance. Pineapples are formed by many different “fruitlets” that join together at the pineapple’s core, according to WHFoods.com. The fruit has a cylindrical shape with a tough skin that ranges in color from brown, to green, to yellow. The flesh inside is a bright yellow color, and has a fibrous texture. Pineapples require a tropical climate to grow. Today, they are being produced by countries such as Thailand, the Philippines, China, Brazil, and Mexico. In the United States, Hawaii is the only state that cultivates pineapples. Pineapples can be used to treat many various health conditions. They have anti-inflammatory properties due to the rare enzyme bromelain, according to OrganicFacts.net. This makes pineapples effective against painful muscle and joint diseases, particularly arthritis. 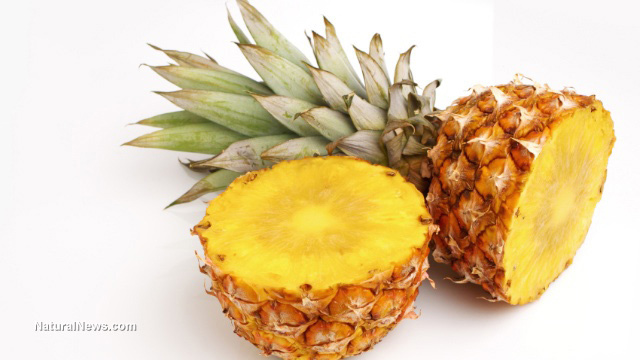 Bromelain also keeps phlegm and mucus from building up in the body, making it a great remedy for cough and colds. As a rich source of vitamin C, pineapples strengthen the immune system, protecting the body against various diseases and reducing cell damage caused by free radicals. Aside from vitamin C, pineapples contain other antioxidants such as vitamin A, beta-carotene, and manganese, making it a powerful cancer prevention food, particularly when it comes to mouth, throat, and breast cancer. The fruit’s beta-carotene content also promotes eye health and prevents macular degeneration. At the same time, vitamin C promotes the healing of wounds and injuries by stimulating the production of collagen, which is the protein found in bone, muscles, hair, and even the inner walls of blood vessels. The fruit is great for promoting strong bones, because it contains a good amount of calcium, as well as manganese. With its astringent properties, it also promotes oral health. Pineapples do wonders for the digestive system, helping treat diarrhea, constipation, and other irritable bowel disorders due to its high fiber content. Fiber also helps remove excess cholesterol from the body. This, combined with pineapples’ abundant amounts of potassium and copper, relaxes blood vessels, regulates blood pressure, promotes better blood circulation, and supports overall heart health. Pineapples are effective in preventing diseases such as atherosclerosis, heart attack, and stroke. It is important to eat pineapples in moderation, as eating too much can result in tenderness or sensitivity in the lips, gums, and tongue. Pregnant women especially should be careful in eating too much pineapple, as the fruit has been known to stimulate menstruation, and may cause miscarriages in very rare cases. This versatile fruit has a pleasant sweet flavor that is enhanced by many different cooking methods. According to Delish.com, pineapples work well in cakes, sorbets, pancakes, and pies. Grilling pineapple slices gives it a pleasant smoky flavor, and makes for a nice and healthy snack. Pineapple can also be drunk as a juice, or blended into a smoothie along with other fruits. Pineapples can be used to treat arthritis and other joint and muscle diseases. Pineapples are an effective cough remedy. They can prevent eye diseases such as macular degeneration and promote overall eye health. They boost the immune system and can prevent certain forms of cancer. Pineapples can protect against atherosclerosis, heart attack, and stroke. They promote healthy bones and teeth. They are high in fiber, making them an effective treatment against diarrhea, constipation, and other bowel problems.